Our main focus on the internet for many years has been to help people find cherished plush lovies. We sell soft toys on our own Dirty Butter Plush Animal Shoppe and run our free Plush Memories Lost Toy Search Service Facebook Group. We have read thousands of stories from people searching for a reincarnation of their childhood beloved toy. 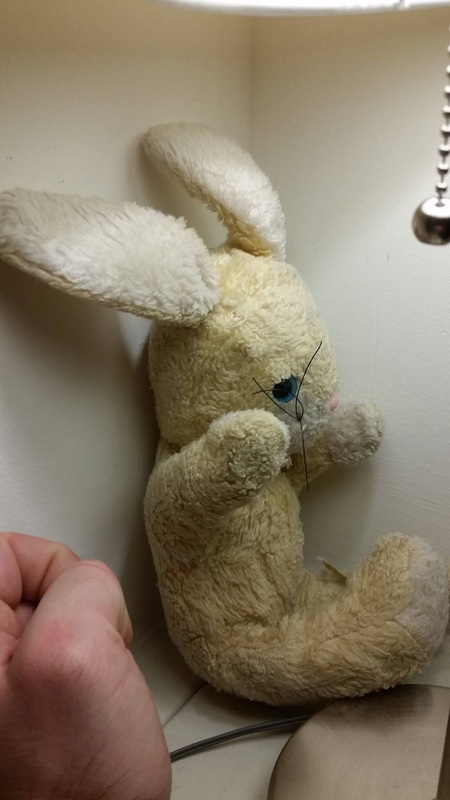 Benjamin would appreciate your help in finding another one of these yellow and white rabbits probably from the 70's or 80's. When I was 2 I lived in Pensacola with my grandparents while I was very sick (1982-84). One day my aunt Becca brought this little dude home for me. She found him in a garbage can at KFC covered in the worst of the worst. She washed him up, and he was good as new. I fell madly in love with him, and to this day I guard him with my life. Now he is my son's, and my son is crazy about him. This rabbit has been all over the world with me. Virginia twice, Alabama twice, Germany and ...all over Europe. I never left home without him, even up until I was 9, I carried this little guy on hikes, played in the forests with him, and rode my bike with him belted somewhere to me. At one point when I was in second grade, I lost him on a Boy Scouts trip, I was devastated for months. I searched Maxwell Air Force Base on my bike for weeks searching for him. I could not sleep knowing he was out in the rain and cold without me. 2 years went by, and I moved to Germany(89-94), certain I would never see him again. I did not let go of him at all that trip, 4th grade or not, I did not care at all. I had rescued my friend. I felt like I had saved the POW from the prison, Mario freed the Princess, and she was not in another castle, Zelda got the tri-force, etc. I guard him with my life now, just shy of breaking into a brawl when someone jokes around with him in the wrong way. It is a war crime to offend my rabbit in my household. He is my rabbit, and I, 33 years old, will walk straight into the mouth of a dragon, and walk right down its throat to get him.... again, if I had too. If a fire breaks out in the house, forget the awards, forget the records, get the family and the rabbit and bolt. He represents a bookmark of all the stories of my life. He was there on the long walks and playing in the mud, cold snowy days, when I was sick, etc. He is something that holds those memories for me. He holds those for me when I can't remember all the details, when my memory slips me, I can recall bringing him on that trip and it all comes back. I want to know more about him, and if there are more. My son claims ownership of him now, but I wouldn't mind having another one. This old, garbage can, chicken rabbit, he is my friend. If you can help Benjamin find a twin of his special rabbit friend, so his son does not destroy his garbage can chicken rabbit, please comment on our Plushmemories Facebook group! His name links to his post on our Facebook group where our Fabulous Finders search the internet, thrift stores, and yard sales to reunite people with their special childhood pals. If you can't help Benjamin, please take a look around our Facebook group anyway. There are plenty of other people who have asked for help finding their special lovie. Who knows - you may have one in the bottom of a storage box, lonely and ready to be loved again!